The recent ruling in the Wisconsin gerrymandering case created buzz about a mathematical approach to identifying gerrymandering. Stephanopoulos advocates a threshold of two seats in elections to the U.S House of Representatives and 8% in State House elections to determine evidence of gerrymandering. In the Wisconsin case, the “efficiency gap” was around 10-12%. In the 2016 Pennsylvania Congressional elections, Republicans received 51.65% of the votes but gained 73.33% of contested seats. Applying Stephanopoulos’ definition only to those contested seats, PA had an efficiency gap of 20.31% in favor of Republican candidates, meaning Republicans earned three more seats than they should have based on their share of the votes cast. Add in the two uncontested Republican seats, compared to one Democratic seat, and the gap is even greater. 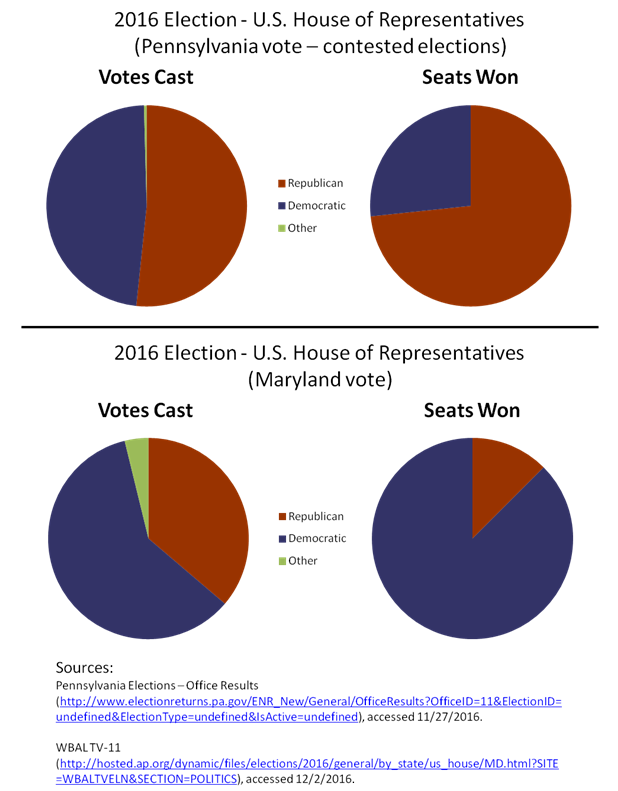 In Maryland’s 2016 elections, all eight seats for Representative in Congress were contested. Republican candidates captured 36.23% of votes cast, while Democratic candidates captured 59.95%. However, Democrats earned seven of the eight seats (87.50%), leaving the Republicans with one (12.5%). This comes out to an efficiency gap of 12.53% in favor of Democratic candidates, meaning Democrats earned one more seat than they should have based on their share of the votes cast. The calculations here are preliminary and more work will surely be done in applying the efficiency gap concept to electoral outcomes across the country. Even so, the simple graphics make clear that gerrymandering gives unfair advantage, resulting not in a House of the People, but in a House of the Politicians, where elected representatives choose their constituents and not, as the Constitution intended, the other way around.